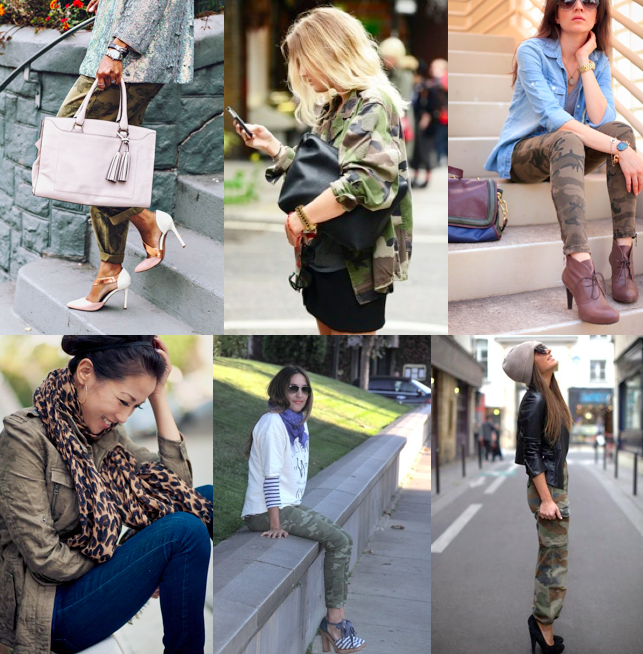 AllyCog: The camo trend: is it still a thing? The camo trend: is it still a thing? For the past few seasons, I've been struggling with the camo trend. I really like it on other people, yet the closest I've gotten to rocking it was on a pretty basic level. But since I really love a feminine look with a little bit of edge, I feel like it's a no-brainer that it should be a trend I'm all over. Especially when I see pieces like these pants! And now that fall shopping is in full swing, I'm once again faced with whether or not to jump on the bandwagon. I guess I can't decide whether or not it's a trend that's here to stay or something I'll look back on and regret. So that's why I'm hashing it out here and throwing it to you! What do you think of the camo trend? And even if it does fade, is it worth having a little bit of fun with? Oh, and in case you need some inspiration, below are a handful of cute, totally wearable pieces. They're all able to be easily mixed into your wardrobe for just a touch of trendy without the fear that your next step will be a camo wedding dress! Your title is so on point because I've been asking the same thing! I purchased a tshirt to have fun with and get at least a finger on the bandwagon! LOVE IT! Love my camo tee and always get so many compliments on it! I went back & forth before finally buying camo too - but I wear my jacket all the time & just bought those Gap pants...LOVE! it better be! I want those GAP skinnies, just saw them yesterday but was too lazy to try anything on! I have mixed feeling about camo, mostly because the clothes you tend to find the print on is poorly fitting fast fashion. I do completely enjoy a military look, but camo itself is hard to pull off in my book. Really loving that Piperlime shirt! I dont own anything camo, but I think I need to take the plunge for fall! ugh.. I can't decide if I like this trend or not. The only way I would probably rock it is with those camo skinnies from Gap and a white v neck tee. I definitely couldn't do a camo shirt or jacket! Well, I'm not one to follow trend waves to the letter. I was rocking camo back when the only place I could find pieces were at actual army supply stores. And I'll still be wearing it if the powers that be decide its "out". I love camo like I love animal print - and rely on it as a neutral. A great print to add edge to girly silhouettes. I grew up in an area where 98% of the population counted down the days to hunting season and all the guys wore camo tux vests to prom...yep, I wish I were kidding. So I've always been a little undecided on camo as a fashion trend, but I have to admit I'm loving those Gap pants. I don't know how often I'd wear them, but I might just have to get them! I'm SO into camo especially for fall! I've been eyeing up a pair of camo pants at Gap.